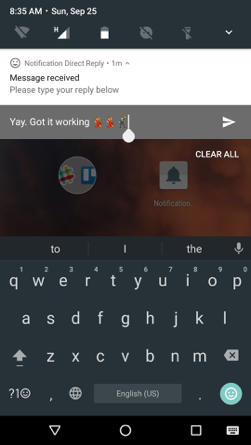 Notifications is one feature that improves at almost every Android update. From single tap notifications, to actionable notifications, Android N also introduces some new features to Notifications in Android. 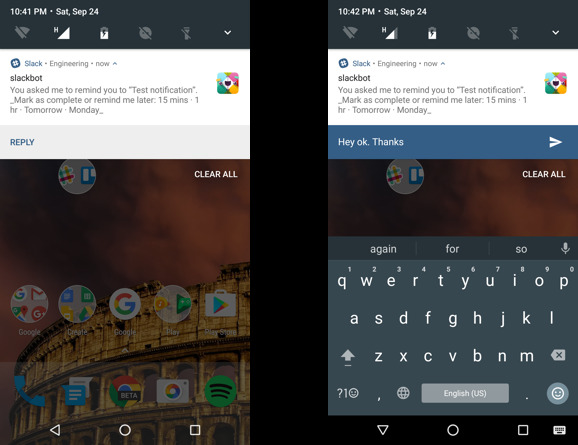 Android N introduces direct reply, notification bundling and other cool features. If you have Android N installed on your device, you may have noticed the new way the notifications appear. You may also have noticed that you can reply messages in-line right from your notification. I noticed this behaviour has already been implemented on quite a number of apps including Twitter, Slack, WhatsApp. This is made possible by Direct reply. Direct reply aims to reduce the number of steps between receiving a notification and acting on it. The image below is direct reply in action on Slack for Android app. In this post, we will walk through the steps in implementing direct reply in your apps. I will cover the new notification styles and bundling notifications in another post. Direct reply makes use of a combination of notification, action and Remote Input. Once a Remote input is added to a notification, Android knows that it should request for input from the user. This happens the same way to request for voice input on Android wear 2.0.
a. Build your label using a remote input. The remote input holds information such as the label to show for the action, and the key that will be used to retrieve the user input later on. Next step is to build the notification action. This uses the NotificationCompat.Action for backwards compatibility. You will then connect the action with the remote input. The pending intent is what describes the action that will be taken when the notification action is clicked. More notes on selecting the pending intent in the next section. The usual next step is to select the appropriate PendingIntent. Now, this is important, because, the best practices regarding the PendingIntent depends on the OS version of the user. Direct reply is new in Android N, and Android already handles the UI, so the right pending intent here will ideally be a Service/IntentService (for a long running background task) or a BroadcastReceiver, which runs on the UI thread. It also works without unlocking, making the process really fluid for the user. However, for Android devices running Marshmallow and below (API level 23 and below), it will be more appropriate to use an activity. Since you have to provide your own UI. Now that we’ve shown the notification, we now want to read what the user has typed in the direct reply remote input. Remember, we had to set a key when we created the remote input in step a above, now is the time to use it. It’s really easy to do that. You can then use that method in the onReceive method of your broadcast receiver. // do whatever you want with the message. Send to the server or add to the db. NB: If you happen to be using a broadcast receiver, ensure that your BroadcastReceiver isn’t exported. The reason for this is, if your component (say BroadcastReceiver) is accessible from a 3rd party app, the app could create fake RemoteInput results and create PendingIntents without any user interaction. This could lead to major security issues. You don’t want your remote input to keep spinning forever, so you should update the notification. It’s good practice, to update the notification, instead of outright dismissal. Dismissal leaves the user wondering whether or not the action was successful or not. To do that, you need the notification id to be the same as the one currently showing. The result of this is something like what we have below. If you want to see more code, I’ve created a demo project on Github. Check it out here: https://github.com/segunfamisa/android-nougat-notification. Please remember to star the repo :D. Thanks. Hey, thank you for reading! If you have any comments/suggestions or corrections, feel free to drop a comment below or tweet at me.